DCS modules that can plug into DCS World can include aircraft, maps, ground units, campaigns, etc. 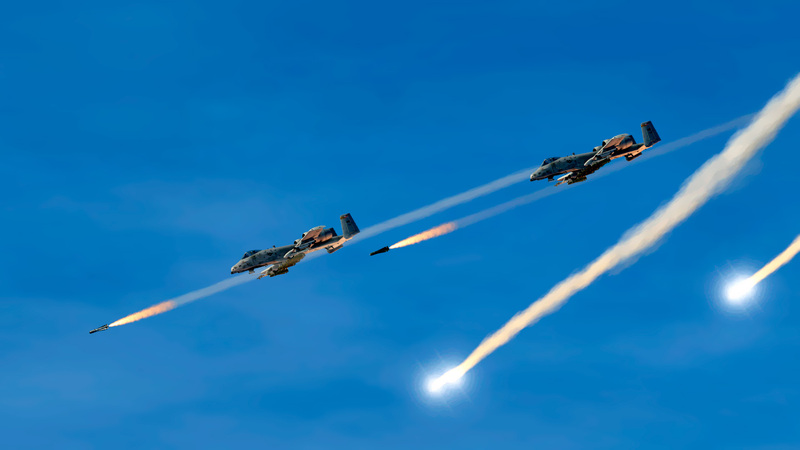 Not only can DCS World include modules developed internally by Eagle Dynamics, but it can also include those by certified third party developers. The first third party aircraft will be the UH-1H Huey. DCS World includes a FREE Su-25T “Frogfoot” attack aircraft! DCS: A-10C Warthog. Warthog brings the most realistic PC simulation of a modern fixed wing combat aircraft in regards to flight dynamics, avionics, sensors, and weapon systems. Warthog is considered by many to be the current bench mark of PC flight simulation. DCS: Ka-50 Black Shark 2. The Ka-50 “Black Shark” is a unique and deadly single-seat, Russian attack helicopter that has seen combat in the Northern Caucasus. It combines a high performance dual rotor system with a deadly weapons payload of guided missiles, rockets, bombs, and a 30mm cannon. DCS: P-51D Mustang. The most realistic simulation ever done of this legendary World War 2 ear fighter. DCS: Combined Arms. DCS: Combined Arms gives you control of ground forces during the battle. Use the Command Map to move ground forces, set artillery fire missions, and control the ground battle. Assume the role of a Joint Terminal Attack Controller (JTAC) in multiplayer and designate targets for player-controlled close air support aircraft, or directly control armor vehicles or air defense weapons and engage the enemy.